Thank you Donors, Corporate and Community Partners! 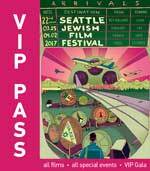 The Seattle Jewish Film Festival (SJFF) owes its success, steady growth, and longevity to our generous and loyal donors, sponsors and partners. Ticket sales revenue only comprises 25% of our hard costs and operational expenses, making sponsorship a vital imperative. Thanks to tremendous financial, media, hospitality, outreach and in-kind support – SJFF, now in its 23rd year and is recognized as one of the leading Jewish festivals in Seattle, the US and internationally. SJFF is also a respected cultural contributor and arts festival in the Pacific Northwest region. Review individual, corporate or community partner donation levels and benefits and make a donation online. Make a pledge of support. Benefits include passes, special events, VIP Gala and year-round exclusive invitations, and for companies and community partners, SJFF presents unparalleled opportunities to promote your work/mission and produces to 7,500 well-heeled, highly educated and engaged patrons with discretionary income. SJFF's program is mailed to 20,000 homes, our trailer appears on Comcast Xfinity and AMC Theatres, and our year-round social media initiatives. To learn more about sponsorship opportunities, advertising and exposure at SJFF and our vast network of 7,500 patrons (20,000 programs mailed; 1,000 Facebook Fans; 7,000 email blast subscribers). Donations are tax-deductible. Circle of Friends giving society: $1,800+ = Year-Round Benefits! Those giving generously at $1800+ enjoy additional benefits, such as invitations to sneak-peek film premieres, comp tickets to year-round films and encores at the Stroum JCC, and (NEW!) a $100 gift card to redeem for tickets in our 2018/19 Arts+Ideas season lineup (view brochure) - your credit is good for one year, through December 2018. Choose from global music and comedy shows, chef and author talks, theatre, culinary events, film screenings and more. Email required. Please check or complete your email address. J Members: Discount Pricing & No Processing Fees Ever! Our new ticketing system recognizes current J Members so you never pay ticket processing fees.